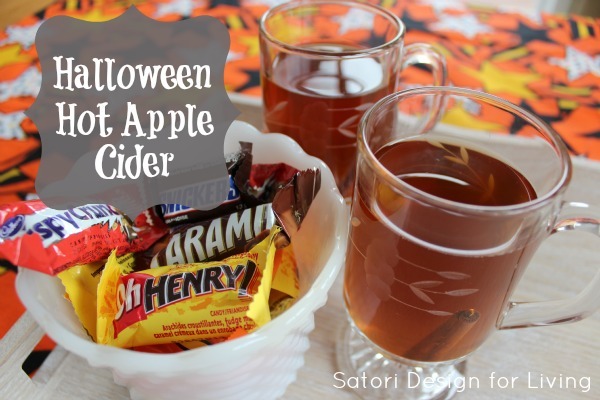 Warm up your trick-or-treaters, big or small, with this hot apple cider recipe you can make ahead of time. Tomorrow may be Halloween, but it feels and looks more like Christmas outside. I’m hoping it will warm up a bit for the trick or treaters, though I think it’s probably best to bundle up. Halloween has changed for us over the years, from decorating a couple weeks before and always designing and sewing my son’s costumes, to throwing some decorations together on the 31st and leaving my son’s costumes up to him. I’m not the Halloween scrooge, but since he’s hit high school, it just isn’t a big deal for us any more. However, we do enjoy seeing the little ones dressed up and it’s a good excuse to eat mini chocolate bars. We also like turning on the fireplace and sipping some sort of hot drink while we take turns going to the door. Occasionally, a family needs to warm up and ends up making a pit stop at our house. This year I want to be prepared and I’ve decided to make hot apple cider (with or without alcohol). Place two cinnamon sticks, all the cloves, orange peel and lemon peel in the center of a rinsed square of cheesecloth. Fold up the sides of the cheesecloth to enclose the bundle, then tie it up with kitchen string. Drop the spice bundle into the cider mixture. Place the saucepan over moderate heat until the cider is very hot, but not boiling (about 10 minutes). Remove the cider from the heat. Discard the spice bundle and ladle the cider into 4 mugs (with or without rum), adding a fresh cinnamon stick to each serving. Note: This can be made in a small crockpot and kept warm for guests (double or triple the batch for larger groups). Don’t add the rum until you are ready to serve. This can be made in a small crockpot and kept warm for guests (double or triple the batch for larger groups). Don't add the rum until you are ready to serve. 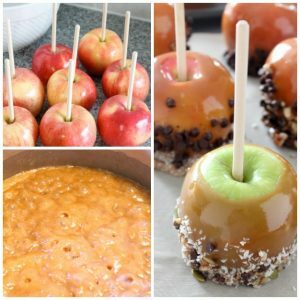 If you’re looking for another Halloween sweet treat, check out my recipe for delicious caramel apples! Have a safe and fun-filled Halloween! Yum, that sounds fabulous! I’m actually drinking some cider I made tonight and the recipe is pretty similar (though I don’t add the citrus peels, I bet that’s awesome!) And we ran out of rum somehow, so I ended up putting peach brandy in it (why did we have peach brandy and no rum, who knows), but it is still pretty delicious. :-) Thanks so much for sharing the recipe at The Fun In Functional!